The secret to unveiling the magic of beauty is to find beauty in everything…yes, everything. There is a radiance that glows from ALL THAT IS and brings us to a higher state of fulfillment. Our cultural attachment to duality keeps us from happiness. We see things as good or bad, beautiful or ugly, meaningful or meaningless. We feel good when someone or something is good, beautiful or meaningful, but are repulsed by or avoid what is bad, ugly, or meaningless. The problem is that we’re never satisfied because we are always chasing the next thing to make us feel good and there are so many interpretations of what that is. The solution is to accept everything for what it is. True appreciation of beauty starts with you. Until you see your own beauty, you will be blind to the depth of beauty available. I’m not talking about thinking that you are “okay looking”, or have a “few nice things” about you. I’m talking about a deep knowing that every aspect of your inner and outer self is radiant and beautiful. This is no easy task in our society with a multi-billion dollar industry that thrives on our fear of not being beautiful enough. You don’t need to wear make-up to be beautiful; you only need to smile, and that will beautify the world. Let your inner light shine through every cell of your body! Once we are fully in touch with our own beauty, one of the greatest challenges is to learn to look at anyone, anything, or any situation and recognize the beauty of what can be discovered within the obvious, or beyond our cultural or personal biases. Again, without judgment or criticism, take a look around your environment. What is available when seen through the eyes of beauty? Can you look at a snake, bat, or tarantula and find the beauty? Be open to the dynamic dance of inner and outer beauty, holding both as sacred. 1. Stand naked in front of a mirror and appreciate yourself. Find the beauty in every aspect of your body. Love your lumps and bumps, sags and scars. Twirl around and get a good look at the whole package; leave nothing unloved for its beauty. 2. Look directly into your own eyes in a mirror and let your ego take a break. With every breath, empty. Empty your mind, letting go of all thought, judgment, and old patterns. Become a vessel for your divine essence to pour love energy into. When you see the light coming through your eyes, stay with it for as long as you’d like. Then, take a moment to write down a few of the words or feelings that describe what you see in yourself. 3. Walk in nature with the highest level of awareness and sensitivity you can achieve. In nature, sensitivity is our greatest asset. Feel the elements of earth below your feet, the wind and sun on your face, hear the details of every sound, smell the air, appreciate the shapes, and dramatic shades of colors (it is amazing to notice how many shades of green or brown can be in one landscape). Beauty is a condition of the heart connecting with our essence. Beauty is all around us ALL the time. We merely need to open our hearts, minds, and eyes to it. Have fun discovering! 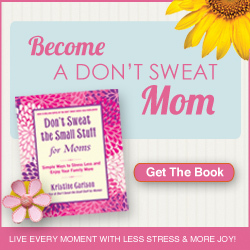 Kristine Carlson’s Don’t Sweat the Small Stuff for Moms, launches April 10th! Join 21 luminaries and learn their secrets to lighting up the world. Tune in and share tools and processes for igniting Divine presence, purpose, prosperity, wellbeing and love. Learn from the wisdom of Marci Shimoff, Jeanna Gabellini, Tambra Harck, Eva Gregory, Stephanie Beeby, and many more! I will be presenting the Awaken the Champion program on April 25th. Every Wednesday at 10am pacific I have a blast interviewing some of the coolest people on the planet. It’s all about sharing ways to bring out our excellence and live a joyful, inspired life! Wishing you a fabulous Spring!